Murray Mallee LLEN is a key initiative of the Victorian Government to promote strong pathways from school to further education and work for local young people our region. Murray Mallee Local Learning & Employment Network is a not-for-profit organisation responsible for the area of north-west Victoria covered by Swan Hill Rural City Council (excluding Robinvale), Gannawarra Shire (excluding Cohuna) and Sea Lake in the Buloke Shire. The Pathways Information Service helps young people, parents and families with career goals and helps identify relevant pathways to education, training and employment. The free program is a partnership between Murray Mallee LLEN, Swan Hill Rural City Council, Gannawarra Shire Council and Kerang and District Community House. Information is available from the Swan Hill Regional Library, Kerang’s Sir John Gorton Library and the Kerang and District Community Centre. The Local Guide which includes the Top 10 careers websites and a listing of local services who can help you. Further information is available through project@mmllen.com or call 5033 2017. You can also view the Local Guide and the Murray Mallee School Leavers Guide. The Central Murray Careers Network is made up of Careers Teachers and staff from secondary schools across the region as well as training organisations and service providers. The aim of the group is to share information, network and hear from guest speakers with relevant and interesting information. 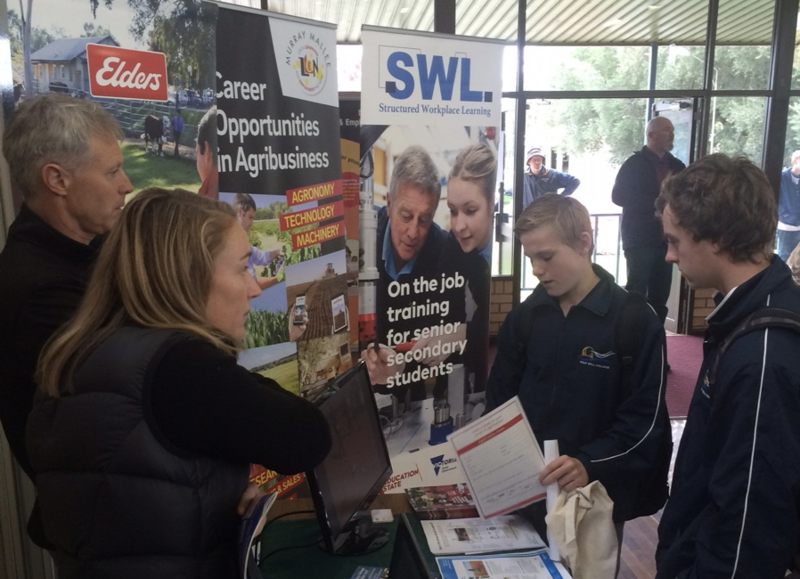 One of the key events for the network to be involved in is the Central Murray Careers Expo which was held at the Swan Hill Grain Shed in 2018. The event included seminars throughout the day from Deakin University, SuniTAFE, Racing Victoria, MAS National and Young Workers Centre, giving the students more in-depth information about careers and training.